Terms and conditions is a page in the form which sets out the rights and responsibilities of anyone using the form. It effectively forms a contract between the site and the user. Terms and conditions often include an explanation or definition of key terms used in the terms, etc.. This is the easiest way to perform it. 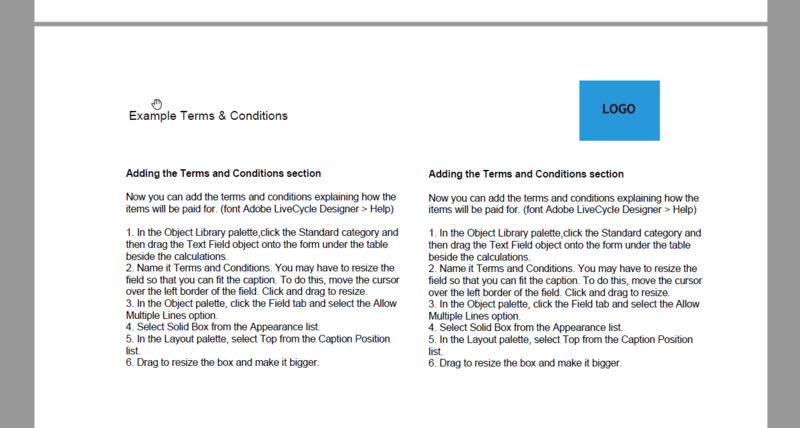 Using the Adobe LiveCycle Designer, you can insert a new Master Page, insert your terms and conditions in a Text box and in Object > Master Page palette select Restrict Page Occurrence , then your terms and conditions will be always displayed in last page. Very nice blog and quite interesting. I have come across the same situation recently and stucked up with one issue. For some company codes the terms and conditions would not be there and that would result in printing a blank page. Since it’s a master page we can’t hide that. How to get rid of that blank page?